The Kajuru Castle isn't ancient. 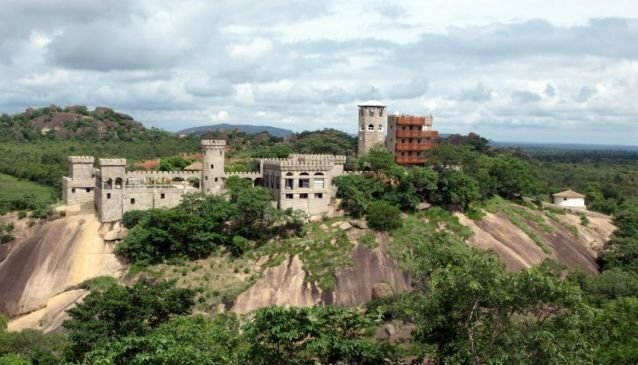 It isn't even African in the sense that it was built by an eccentric and visionary German businessman by the name Burg Heinrichswalde in Kaduna. It was built in an European and German fashion. It has a baronial hall, complete with suits of armor. The Kajuru Castle has dungeon like bedrooms and towers with crenulated walls. There are even crocodiles in the pits guiding the castle. The castle overlooks a vast, peaceful and picturesque savanna. It is a good place to have families and small private parties. The atmosphere is quite relaxing and conducive. The castle is fully equipped for luxury self service. There is a swimming pool, and the klitchens come with modern kitchen items as well.